Use Mechanic to create regularly updated feeds of shop data. In this tutorial, you'll learn how to create a feed of your shop's data, and make it available on your online store, at a URL like https://example.com/pages/feed. Immediately after adding the task, run it by clicking the "Run task" button. This will populate your shop's records with the initial value of the feed. 2. Create a page template, called "page.feed.liquid". 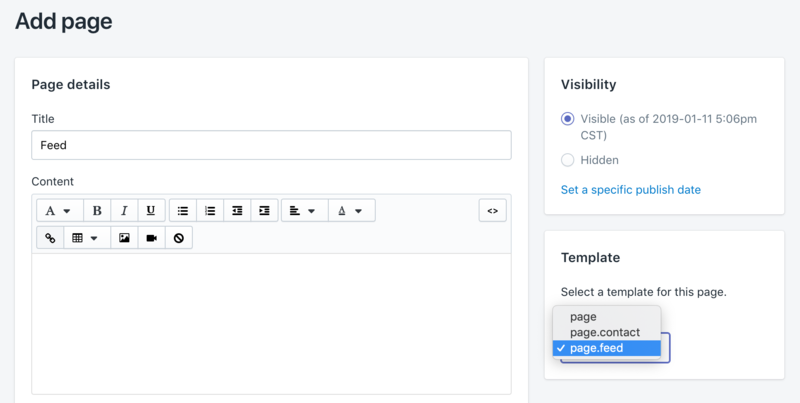 This is the template that will be responsible for displaying your feed contents, without the usual page formatting that your shop's theme usually applies. To do this, navigate to the "Themes" section of your Shopify admin (under "Online Store", or by searching for "themes"). Then, under the "Actions" menu for your current theme, click the "Edit code" link. Next, click "Add a new template". Then, select the option for creating a "page" template, and fill in the textbox with the name "feed" (or another template name to your liking). 3. Create a new page to use as your feed. Navigate to the "Pages" section of the Shopify admin (under "Online Store"), and click the "Add page" button (or search the admin for "add page"). Name the page "Feed" (or another name of your liking), and change the page template to "page.feed.liquid". Open up the page you just created, and you should see the contents of your feed. :) If you have any questions, just use that chat button in the corner - we're here to help! Because this task stores feed values as a shop metafield, the feed may only contain and display up to 65,535 characters.